Originating in the Valtellina in Italy’s Lombardia region. 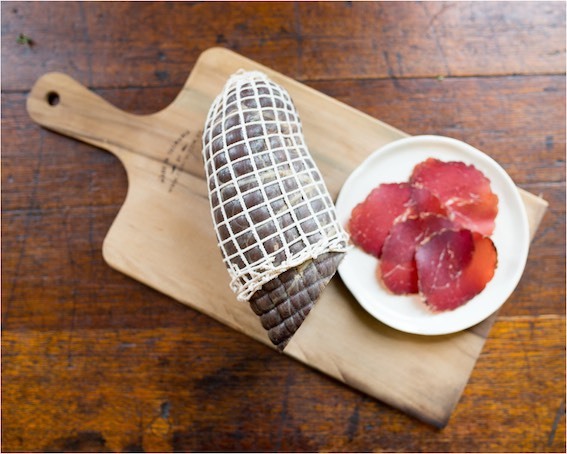 This rich dark red salumi is traditionally made with the eye round or girello cut which is particularly lean. It is spiced/salted and then dried for approximately 3 months in which time it will lose approximately 40-50% of it’s original weight. Sliced thinly and dressed with olive oil and lemon juice it will make a delicious appetizer. It also goes well with rocket and parmesan or on a simple pizza base with mozzarella.